Place rump on a plate and brush with 1 tbsp olive oil. Cut potatoes into chunky chip shapes and mix in a bowl with grated lemon zest, rosemary, 1 tbsp of olive oil, salt and pepper. Spread on a large baking tray and roast for 30 minutes at 200oC fan forced until deeply golden and crispy. Heat remaining oil in a large frying pan over high heat, add butter, onion and thyme leaves and cook, stirring often for 5-8 minutes until onion has softened and is starting to turn golden. Add mushrooms and allow to brown, do not stir too much. Season. Cook for 5 minutes, stirring only occasionally. Once mushrooms have good colour, add mustard, Worcestershire and wine, allow to bubble up and reduce. Add stock and stir, scraping the bottom. Remove from heat. Allow to cool slightly then stir in yoghurt. Heat a lightly oiled BBQ or chargrill pan over high heat and cook steak for 3 minutes each side, until medium rare, or to your liking. Serve steak, thickly sliced, with chips, sauce, broccolini and beans. If your steak is less than 2cm thick 2-3 minutes per side should be fine, but if 2-3cm thick it might need 3-4 minutes per side medium rare. This Father's Day, ditch the socks and give your old man something he really wants – a juicy beef steak. Research has revealed that nine in ten (88%) Aussies think a perfectly cooked steak is a ripper gift idea for their dad, so make sure you plan a visit to your local butcher and fire up the grill for a happy dad. 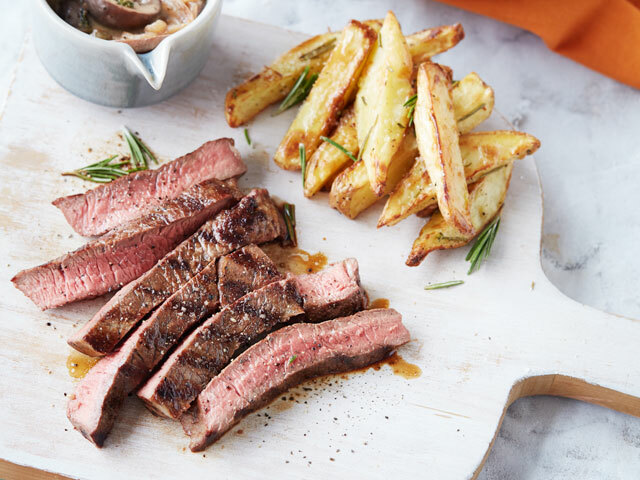 To help you master steak in a style that will have your Dad full with pride, Australian Beef is sharing five of the best recipes to whip up this Father's Day. Proving you don't need to spend hours in the kitchen to impress the special man, recipes such as steak frites with a knockout mushroom sauce and a rib eye with a spicy quinoa and bean salad, are quick and easy to prepare. Better yet, to help guide you in your choices, Australian Beef butcher Doug Piper has shared his top tips for choosing the perfect cut of beef and cooking it to perfection. Ask your butcher – Your butcher will be able to help give advice depending on the dish you wish to create and how you plan to cook your steak, so don't be afraid to ask. Refer to an app – There are great information sources online, so do some research with apps like MeatCuts app, designed to help when making your decisions. Relax on the flipping - Only flip the steak once and allow ample rest time to ensure a juicy and tender steak. The rule of thumb is to rest for half the amount of time it's been cooking. Get support to cook perfectly – Take the guesswork out of how long to cook your steak and instead download the SteakMate app, input the details of cut and desired doneness, and let it do the timing for you. A super simple way for a perfect cook every time! For additional recipe inspiration, visit www.australianbeef.com.au.